Combustion deposits are slight and not heavy enough to cause any detri****** effect on engine performance. Note the brown to greyish tan color, and minimal amount of electrode erosion which clearly indicates the plug is in the correct heat range and has been operating in a "healthy" engine. May be caused by a foreign object that has accidentally entered the combustion chamber. When this condition is discovered, check the other cylinders to prevent a recurrence, since it is possible for a small object to "travel" from one cylinder to another where a large degree of valve overlap exists. 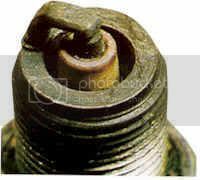 This condition may also be due to improper reach spark plugs that permit the piston to touch or collide with the firing end. Too much oil is entering the combustion chamber. 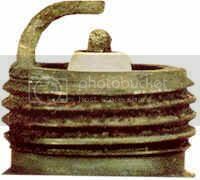 This is often caused by piston rings or cylinder walls that are badly worn. Oil may also be pulled into the chamber because of excessive clearance in the valve stem guides. 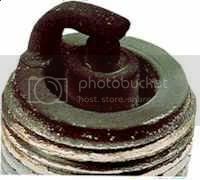 If the PCV valve is plugged or inoperative it can cause a build-up of crankcase pressure which can force oil and oil vapors past the rings and valve guides into the combustion chamber. 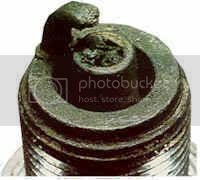 A clean, white insulator firing tip and/or excessive electrode erosion indicates this spark plug condition. k This is often caused by over advanced ignition, timing, poor engine cooling system efficiency (scale, stoppages, low level), a very lean air/fuel mixture, or a leaking intake manifold. When these conditions prevail, even a plug of the correct heat range will overheat. Glazing appears as a yellowish, varnish-like color. 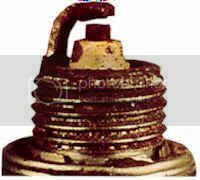 This condition indicates that spark plug temperatures have risen suddenly during a hard, fast acceleration period. As a result, normal combustion deposits do not have an opportunity to "fluff-off" as they normally do. Instead, they melt to form a conductive coating and misfire will occur. Usually one or a combination of several engine operating conditions are the prime causes of pre-ignition. It may originate from glowing combustion chamber deposits, hot spots in the combustion chamber due to poor control of engine heat, cross-firing (electrical induction between spark plug wires), or the plug heat range is too high for the engine or its operating conditions. Rarely occurs in automotive engines, however, this condition is caused by similar conditions that produce splash fouling. Combustion deposits thrown loose may lodge between the electrodes, causing a dead short and misfire. Fluffy materials that accumulate on the side electrode may melt to bridge the gap when the engine is suddenly put under a heavy load. 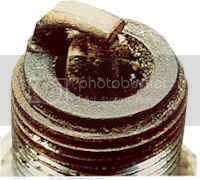 Appears as "spotted" deposits on the firing tip of the insulator and often occurs after a long delayed tune-up. By-products of combustion may loosen suddenly when normal combustion temperatures are restored. 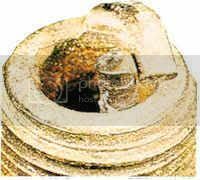 During hard acceleration these materials shed from the piston crown or valve heads, and are thrown against the hot insulator surface. 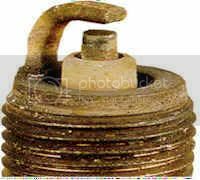 This form of abnormal combustion has fractured the insulator core nose of the plug. The explosion that occurs in this situation apples extreme pressures on internal engine components. Prime causes include ignition time advanced too far, lean air/fuel mixtures, and insufficient octane rating of the gasoline. A build-up of combustion deposits stemming primarily from the burning of oil and/or fuel additives during normal combustion ... normally non-conductive. 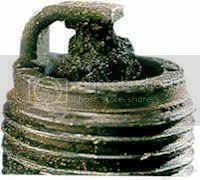 When heavier deposits are allowed to accumulate over a longer mileage period, they can "mask" the spark, resulting in a plug misfire condition. 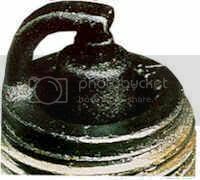 Soft, black, sooty deposits easily identify this plug condition. 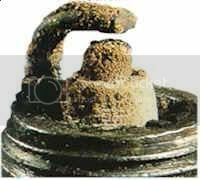 This is most often caused by an over-rich, air/fuel mixture. Check for a sticking choke, clogged air cleaner, or a carburetor problem - float level high, defective needle or seat, etc. This may also be attributed to weak ignition voltage, an inoperative preheating system (carburetor intake air), or extremely low cylinder compression. Last edited by Hoffmann; 07-27-2010 at 02:28 AM. 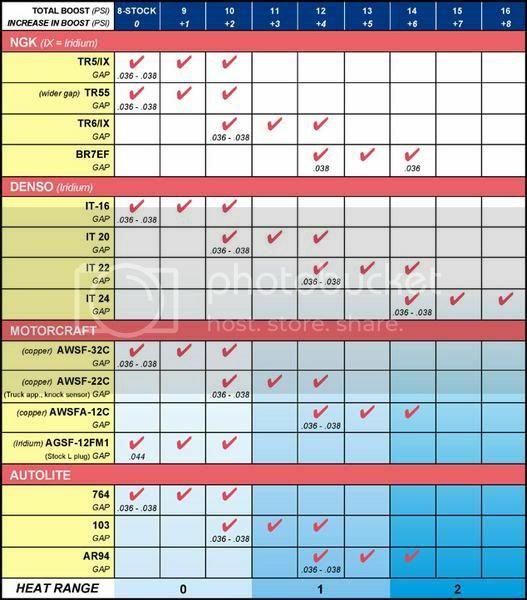 I bought autolite xp103 and was wondering if they r OK to run on stock boost?